You’ll never look at Mickey the same again. We asked the BuzzFeed Community for the scariest Disney Park conspiracy theories they've ever heard of. Here are the spine-tingling results. 1. Someone got decapitated on Disney World's Space Mountain. Legend has it that a man stood up on the coaster and got his head cut off. Though this has been debunked, a man DID stand up on Disneyland's Matterhorn in 1964, hitting his head, which resulted in his death. 2. The spirit of a little boy lurks in the Haunted Mansion in Orlando. Cast members have said they hear him giggling and mimicking the “hurry back” lady after the ride shuts down at night. 3. The characters on Disneyland’s It’s a Small World ride come to life even when unplugged. Cast members often SWEAR that they see the dolls blink or appear in different places than the day before. 4. Walt Disney still haunts his firehouse apartment on Main Street at Disneyland. 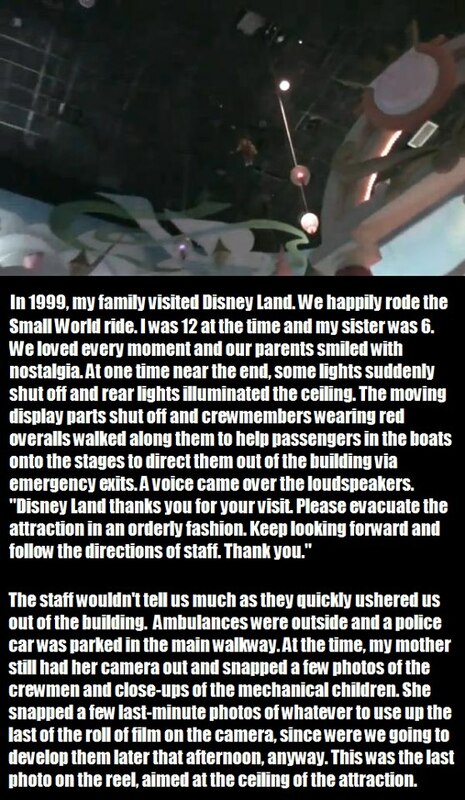 An employee was cleaning the apartment shortly after Disney died, and the lamp in the window kept turning on by itself. Now the park keeps the lamp on as a tribute to Disney. People swear they occasionally see the curtains moving on their own. 5. People constantly try to dump the ashes of their loved ones on Disney property. This has supposedly become so much of a problem over the years that employees have been trained on how to handle a guest when they think remains are being scattered around Disney. 6. The ghost of a former employee haunts Disney World’s Tower of Terror. The story goes like this: A cast member had a heart attack while loading guests onto the ride, and died in the building. His spirit haunts the ride now. Platform D is the supposed ~spooky spot~ that current employees are scared of. 7. The séance book in Disney World's Haunted Mansion was originally a real, 14th-century book of witchcraft. "Cast members had the hardest time keeping the book in the upright position. The table would often be turned over, or the book would be somewhere else. They finally had to replace it." 8. The Pirates of the Caribbean ride at Disney World is haunted by a spirit named George. "My sister’s roommate did the college program and she said that if they didn’t say ‘Good morning, George’ and ‘Goodnight, George’ at the beginning and end of the day, respectively, the ride would shut down and they’d have problems with it all day." 9. A teen drowned trying to swim from Tom Sawyer Island back to the main Disneyland Park. Two brothers snuck out and hid on the island until park closing. They tried swimming back to the main park, the older with the younger one on his back, but the older one went under. They found his body the next morning. 10. A ghost used to haunt the People Mover in Orlando, which would cause the ride to shut down all the time. "A young kid died on the ride by jumping from car to car. We SWEAR his spirit haunted the stockroom and he'd open the emergency exit doors on the track that were locked." 11. A cast member was crushed between the walls of Disneyland's America Sings ride. This was one of the most tragic events in Disney Park history. After the incident in 1974, the ride was rebranded to the Carousel of Progress, and eventually shut down altogether. 12. Disneyland has a strange ghost who can sometimes be seen running along the monorail track. While the ghost part may not be true, a man DID die after trying to sneak into the park in 1966. Thomas Cleveland climbed a wall onto the monorail track. When spotted by security, he bolted and was hit by the monorail. 13. Someone hanged themself on It's a Small World at Disneyland. 14. The spirit of a man haunts Disneyland's Space Mountain, and sometimes people see him "fall off" the ride. "Mr. Wedway died while helping build the ride, and never got to see it finished. Sometimes he'll ride next to you. When I worked at Disney we'd have guests screaming that there was a guy next to them on the ride who was there but fell out!" 15. A man died of a heart attack while riding Disney World’s Haunted Mansion because it was too terrifying. Okay, this ended up being untrue. People speculated this was the reason for the delayed opening of the ride, but the unfortunate true reason was Walt Disney's death in 1966. 16. There's an abandoned water park at Disney World, and allegedly music still plays over the loudspeakers. It was called River Country, and was open from the '70s until 2001. People who've documented their explorations of the park in recent years have been dealt heavy repercussions from the Disney Company. 17. And Walt Disney was suspected to use Club 33 for Freemason (or, y'know, Illuminati) meetings. Many people thought Walt Disney was a member of the Freemasons, a group that, in many conspiracy theories, is believed to be run by the Illuminati, in an attempt to establish the New World Order. CREEPY.